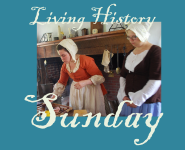 Join us for a day of colonial cooking and conversation about the use of herbs and plants as food, medicine, and fixes around the colonial home! Cooking demonstrations throughout the day in Graeme Park’s reproduction kitchen. Presentation at 2:00 p.m. on the surprisingly various uses of common colonial herbs and garden plants. Tours of the Keith House scheduled throughout the day.